This is not 'Bread and Butter Pudding'. Bread Pudding is much less rich. In August I posted a piece on Bread Pudding dishes from around the world but teasingly I didn't post any recipes. To make up for that, here's a recipe for English Bread Pudding based on the one in Beyond Nose to Tail written by Fergus Henderson and Justin Piers Gellatly of St John. This is the follow-up book to Henderson's Classic Nose to Tail Eating. In conversation with Justin one day I learned they sometimes use their leftover Raisin Bread to make this pudding and that is what I've used in the dish photographed above. If you can get a good raisin bread, give it a go but any good quality stale sandwich bread can be used together with dried fruit so I have reflected it in the recipe below. As it is cooking, the spicing will make you think of Christmas and put you in the mood for mixing that Christmas Pud or Cake which we should be turning our attention to soon. You sometimes see grey, unappetising squares of what they call 'bread pudding' in high street bakery shops in England. Whatever you do, do not buy it! Here is the real deal. 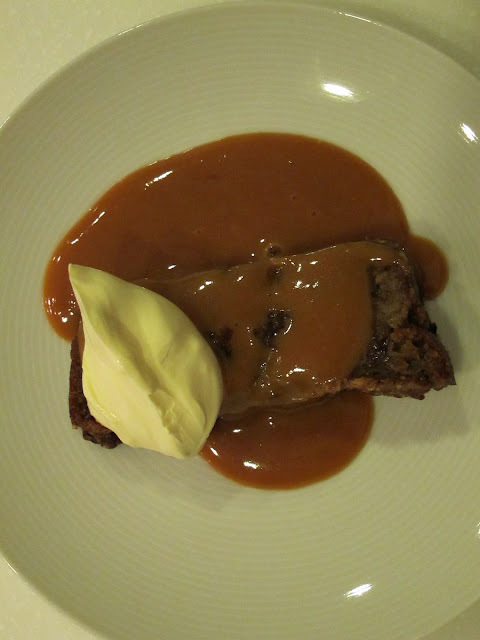 At St John Bread and Wine they serve this dish with vanilla ice cream and sometimes use ginger cake or date loaf instead of bread pudding. All three work brilliantly but the thriftyness of bread pudding appeals to me particularly and, as Fergus says, "never waste yesterday's bread". Cut the crusts off the bread and rip the bread into small pieces. Place in a bowl, cover with water and soak for 30 minutes. Butter a deep baking dish. I find a loaf tin around 10cm x 20cm is about right but be sure to use a deep dish or you'll end up with a biscuit rather than a pudding! Pre-heat oven to 170C. Put all the remaining ingredients, except the butter and demerara sugar in a large bowl and mix with a wooden spoon for 3-4 minutes. Squeeze all the excess water out of the bread then add the bread to the mixture. Stir again for 3-4 minutes. The final mixture will be very wet. Pour it into the prepared dish. Scatter the diced butter and the demerara sugar over the top. Bake in the oven until golden brown - I find if I use the raisin bread as my main ingredient it needs no more than 1 hour of cooking, but the bread and extra fruit version takes 1½ hours at 180C according to the recipe in the book. This does make rather a lot of sauce so, personally, I find halving these quantities makes quite enough. Put the sugar into a heavy-based saucepan with 2 generous tablespoons of water and melt over a low heat. Tilt the pan gently occasionally to melt the sugar evenly but don't swirl it or you'll end up with a hard crust of sugar around the pan which won't melt. Resist the urge to stir it. Once the sugar has melted, raise the heat and cook without stirring until the mixture turns golden brown and you begin to get that almost burnt aroma. Slowly pour in the cream (take care as the hot caramel will spit). Then turn the heat down low to allow the caramel to disolve slowly into the cream for a couple of minutes. Take the pan off the heat and whisk in the diced butter a few pieces at a time. Serve a slice of warm pudding with a slick of butterscotch sauce and either a scoop of vanilla ice cream or a little extra cream. Should you not finish the pudding all in one go, it will keep for a couple of days wrapped in clingfilm - fry slices of pudding in a little butter. The butterscotch sauce is also good for a couple of days if kept in the fridge - pour into a heat-proof bowl and warm through over a pan of hot water.